attends The New York Comedy Festival and The Bob Woodruff Foundation present the 8th Annual Stand Up For Heroes Event at The Theater at Madison Square Garden on November 5, 2014 in New York City. Jon Stewart, Seth Meyers, John Oliver, Ray Romano, Bruce Springsteen and Chris Botti are set to perform at the ninth annual “Stand Up for Heroes” event Nov. 10 at Madison Square Garden. The comedy and music show supports the Bob Woodruff Foundation, which funds initiatives to enrich the ives of our nation’s injured veterans, service members and their families. The event itself places injured military members and their families throughout the evening and audience. Springsteen has performed at every one of these events since their inception. Beginning at Town Hall in 2007, moving to the Beacon Theater in 2010, and transitioning to The Theater at Madison Square Garden in 2013, “Stand Up for Heroes” has continued to expand and grow due to its remarkable success. Over eight years, comedians including Stephen Colbert, Louis C.K., Jim Gaffigan, Ricky Gervais, Conan O’Brien, Jerry Seinfeld, Brian Regan and Robin Williams have taken to the stage in an effort to advocate for servicemen and women. Together, the shows have raised more than $27 million. In 2006, Bob and Lee Woodruff (pictured above at last year’s event) found themselves facing similar challenges to injured service members during Bob’s recovery from injuries sustained by a roadside bomb while covering the war in Iraq for ABC News. Inspired by their experiences, they resolved to ensure that our nation’s heroes have access to the same level of support and resources. Tickets for “Stand Up For Heroes” go on sale Tuesday through bobwoodrufffoundation.org or nycomedyfestival.com. The New York Comedy Festival’s full 12th installment runs Nov. 10-15. 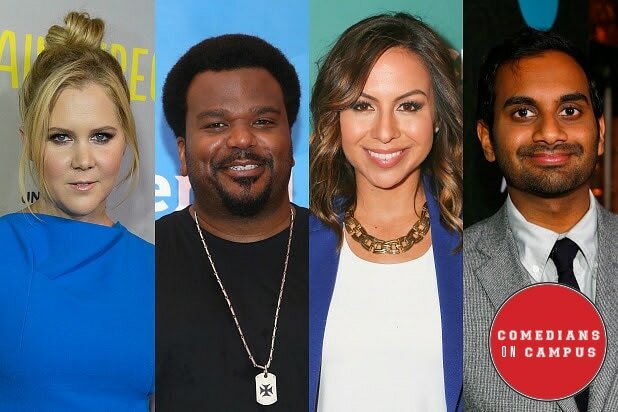 That schedule will consist of more than 200 comedians — including Judd Apatow, Bill Burr, Margaret Cho, Billy Crystal, Nathan Fielder, Gabriel Iglesias, John Leguizamo, Norm Macdonald, Bill Maher, Kumail Nanjiani, Trevor Noah, Patton Oswalt, Iliza Shlesinger, Sarah Silverman, and David Steinberg, performing in over 60 shows at iconic New York City venues such as the Beacon Theatre, Brooklyn Academy of Music, Carnegie Hall, Carolines on Broadway, Madison Square Garden, The Theater at MSG, Town Hall and the 92nd Street Y.